California, Irvine and the Neurotoxin Institute. Supported by an unrestricted educational grant from Allergan, Inc. Understand the conceptual basis and mechanism of action underlying the therapeutic application of BoNTs in a broad array of clinical conditions. Review a range of clinical applications in which BoNT has been shown to have some effect. Identify appropriate patients for therapy and determine condition-specific techniques, including injection-site selection and dosing of BoNT. Discuss procedures for administering BoNT therapy. Method of participation: Please note that the accreditation period for this material has expired. You may still order this handbook for reference purposes, but no CME credits can be earned. Beth Israel Medical Center & Scientiae, LLC. 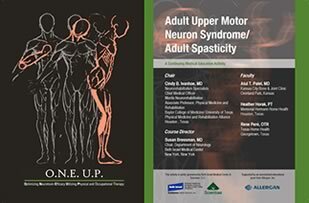 Target Audience: The goal of this program is to educate healthcare providers who manage patients with upper motor neuron syndrome/spasticity including, but not limited to, Neurologists, Physiatrists, Physical Therapists and Occupational Therapists. Needs Assessment: The purpose of this enduring material activity is to explain how patient outcomes can be improved in many cases with adjunctive physical and occupational therapy. There is lack of awareness among botulinum neurotoxin injectors concerning the added benefit of physical therapy and occupational therapy as follow-up to injection therapy for Upper Motor Neuron Syndrome/Adult Spasticity. Physicians, physical therapists and occupational therapists will be able to provide their patients with the accompanying DVD and printed materials. Please register to request these materials. Assess patients with Adult Upper Motor Neuron Syndrome/Adult Spasticity to identify appropriate candidates for adjunctive physical/occupational therapy post-neurotoxin injection. Recognize the importance of adjunctive physical/occupational therapy for Adult Upper Motor Neuron Syndrome/Adult Spasticity patients treated with BoNT for improved patient care. Recall standardized physical/occupational therapy protocols to optimize patient outcome. Instruct their patients on home exercise and home activity programs to provide the comprehensive follow-up needed in these cases. Faculty Disclosure Policy: It is the policy of Beth Israel Medical Center & St. Luke’s and Roosevelt Hospitals that faculty and providers disclose real or apparent conflicts of interest relating to the topics of this educational activity, and also disclose discussions of unlabeled/unapproved uses of drugs or devices during their presentation(s). Beth Israel Medical Center & St. Luke’s and Roosevelt Hospitals have established policies in place that will identify and resolve all conflicts of interest prior to this educational activity. Detailed disclosure information is contained in the course handout materials. Covers a broad array of hot topics, including botulinum toxin for the treatment of cranial-cervical dystonias, motor disorders in cerebral palsy, bruxism and temporomandibular disorders, headache, overactive bladder, chronic pelvic pain syndrome, arthritis joint pain, and wound healing. Focuses on approved uses, but also discusses new and emerging applications to expose you to additional treatment options. 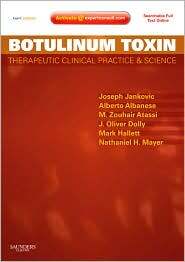 Offers cross-disciplinary guidance from an authoritative, international group of authors who demonstrate the applications of botulinum toxin across various specialties.